Tony's "The Spotlight and Revenue Chat Shows" showcases Influencers, Celebrities & Elite Entrepreneurs highlighting their successes and sharing their wisdom, advice and guidance to his audience. Close to 1,000,000 listeners. Broadcasted on Blog Talk Radio then syndicated to over 200 countries world wide. Past guests include. Kevin Sorbo (Hercules) Tommy Davidson, Tamala Jones, Boo Boo Stewart (Twilight, Disney) most of the Power Rangers all seasons, Vice president Wells Fargo, Founder of Woman Of Global Change, Co-Founder E! Entertainment, Robert Ri'chard, Sean Kanan, Wesley Jonathan, MIcheal Beckwith, Zach Callison (Voice Steven on Steve's Universe Cartoon Network, Shane Sparks (# 7 Top dance choreographer in the world) Shaboo (Breakin 1 & 2) Turbo (Breakin 1 & 2, Booker T (WWE) Bob Wield (Purple Heart War Hero) Many more.. 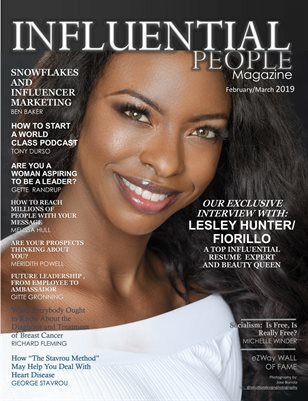 Your Interview on Tony Durso or Chris Salem Sustainable Success or Eric Zuley EZWay Radio show (one of your choice), plus Cover feature on Influential People Magazine. Being featured in newspapers, magazines and on radio and TV can be a great way to build influence, authority and awareness of your brand. However, many small businesses don't have the budget to hire in help with their media relations, and that is where we come in. Did you read our submission guidelines? Checklist to send to influentialpeoplemagazine@gmail.com email or Dropbox. Ready to be featured and interviewed?